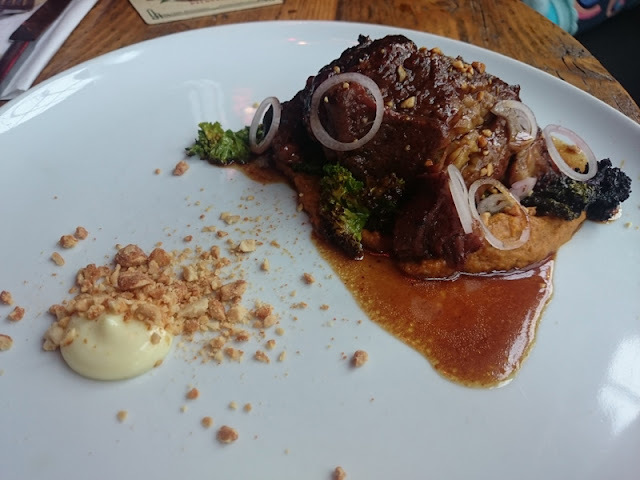 No one else in the city is quite embracing the nose-to-tail concept as well as Flank and now we have a heightened consciousness of food waste, it really is the time to rediscover cuts and parts of meat we have previously been disregarding. After all, it's the cooking and knowledge of preparation that transform ears, cheeks, heads, jowls and the like into something rather extraordinary. 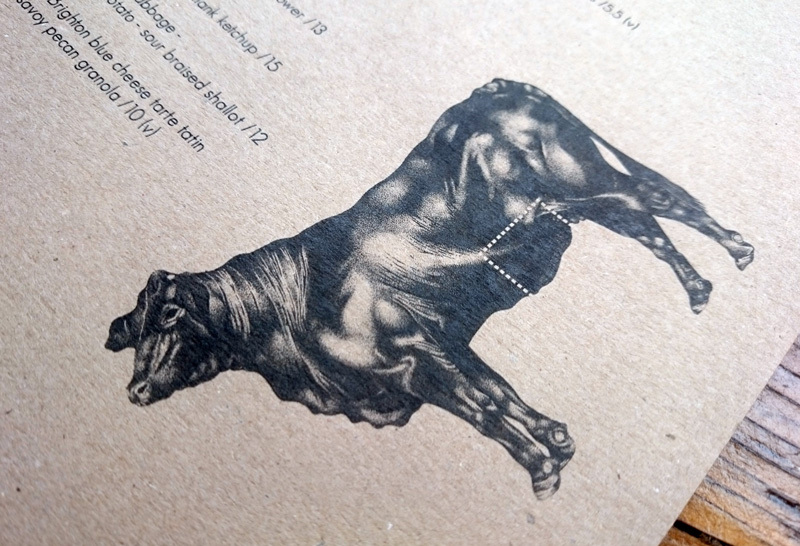 But before we get to the food, can we talk about the illustration on the menu for a bit? It's one of the nicest designs I've seen for a while. By illustrator Lloyd Stratton, you can't tell, but it's made up of thousands of tiny dots. Perfect in its intricate nature as it reflects the precision, detail and care of the food here. We started with a small plate of pickles; one cured overnight and one pickled for two months. Simple and the ingredient as hero. The play between the different texture was interesting but a pretty plate of pickled carrots it was. There was plenty more to talk about with the starters though. The house made sausage was a good introduction to the ethos here. The pig's head and trotter meat was well seasoned and had a pleasant texture from the slow cooking. 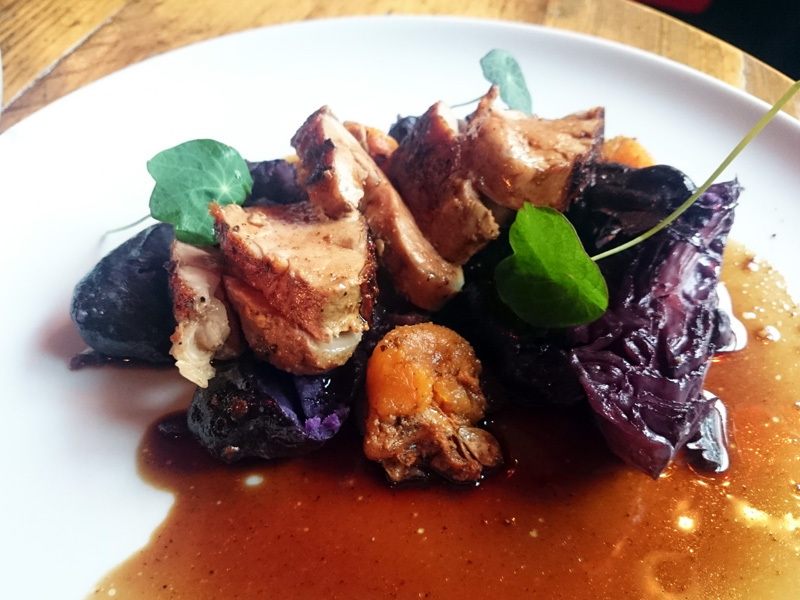 It was matched beautifully with a spiced, roasted apple puree and an intense pork jus reduction. 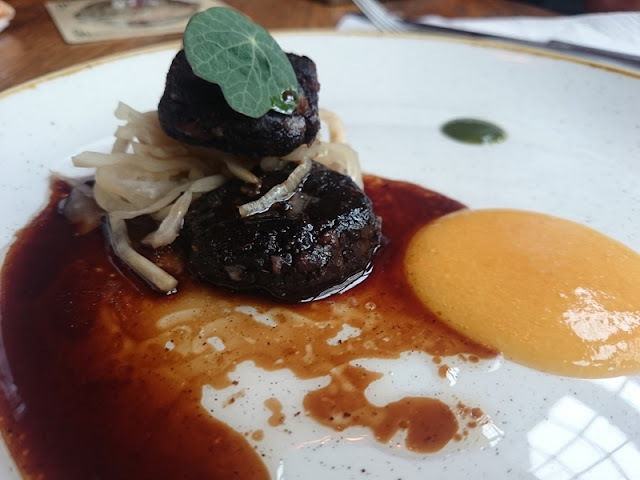 Although quite tiny, the black pudding dumplings were rich and velvety. The peach puree was a surprising contrast that worked very well along with a tiny dot of vibrant green nettle puree. Again, the jus, this time made from hogget, was stunningly deep flavoured and decadent. Both starters were perfectly balanced and a really impressive start to the meal. 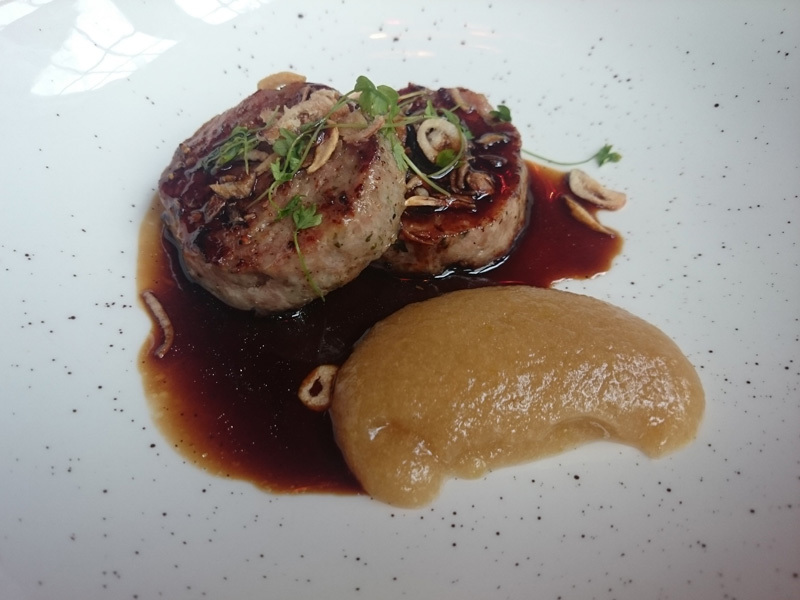 I was surprised to see pork tender loin on the menu as it's quite a clean, tidy cut, but it was beautifully cooked and still succulent with a smoked bacon broth. The purple potatoes were a nice addition and the side dish of greens were slightly caught in the pan, giving them that charred tastiness I adore. 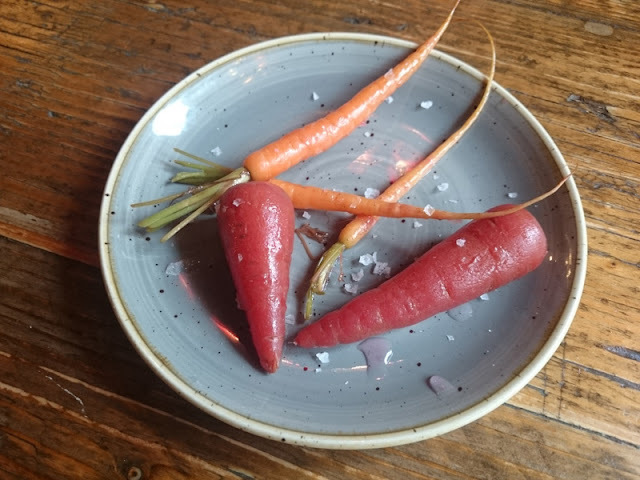 This is no ordinary pub food, the dishes here are a celebration of British produce, refined and inventive, without resorting to trends of dusts, foams and dehydration. They also list what the bloody hell ends up on your plate too rather than that nauseating fashion of listing three ingredients. If I wanted a surprise, I'd buy a Kinder Egg. The only thing that jars slightly for me is the location. 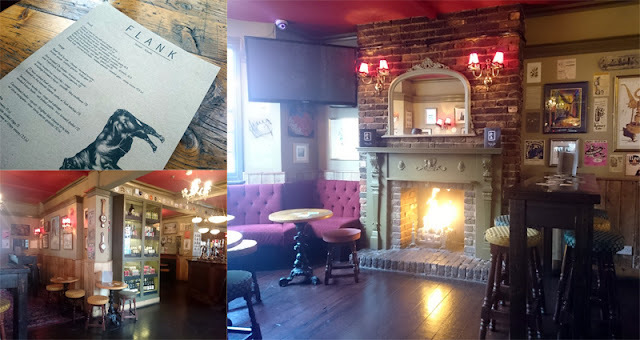 The last time I stepped foot in this pub was a good decade ago and things sure have smartened up, but still, I'm just not sure if The Royal Sovereign is the best environment for food of this level. But don't let that put you off, be it in a pub, shed or coal bunker, I seriously recommend you come and discover what Flank is all about. Chef Tom Griffiths is all about the big, big flavours but they are surprisingly delivered with highly considered elements and delicate detail to each dish which is what makes Flank a cut above the rest. I'm sure with his passion and vision, we'll be seeing Griffiths create some of the most stand out food in Brighton, hopefully with a plant based and a fish based restaurant to add to his portfolio. One to watch. I was invited to review Flank. Words and opinion, as always, my own.